Hello and happy Friday everyone! I know it has been quite a while since I posted. I have been under the weather for the last week and didn’t do any cooking, so I was so happy to finally cook!! I have been wanting to make this soup for so long but for some reason I just never got around to it. But since I have been under the weather soup sounded soooo good!! Trust me I was so glad I made that decision. This soup is so good and is going to become one of my favorite comfort foods now. 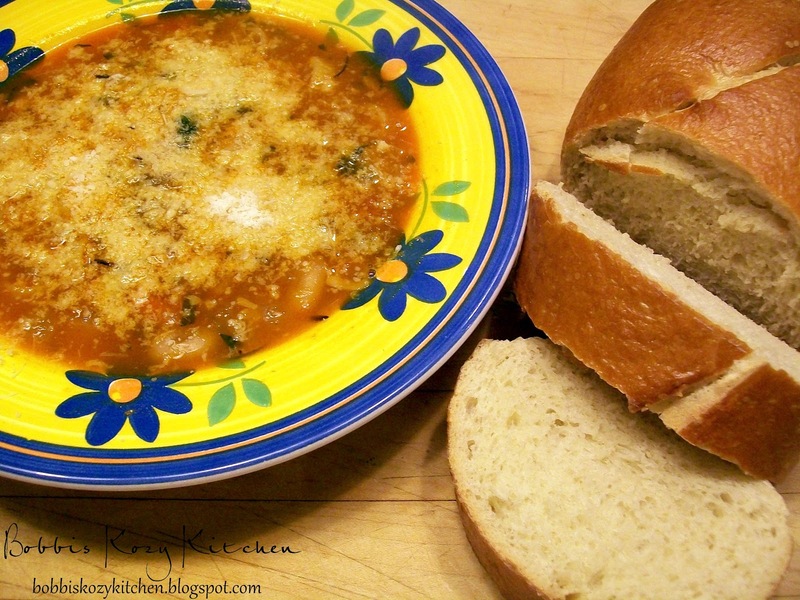 If you like soup and/or Italian flavors you have got to make this. I put crushed red pepper flakes in mine and it just gives it a little heat, but if you don’t like that you can omit them and it would be just as good. Make sure to have some nice crusty bread to sop up all of that tasty broth, and have your appetite with you too!! Heat a deep pot over medium high heat and add oil and pancetta. Brown the pancetta bits lightly, and add herb stems, bay leaf, chopped vegetables, and garlic. Season vegetables with salt and pepper. Add the crushed red pepper flakes, beans, tomato sauce, water, and stock to pot and raise heat to high. Bring soup to a rapid boil and add pasta. Reduce heat to medium and cook soup, stirring occasionally, 6 to 8 minutes or until pasta is cooked al dente. Rosemary and thyme leaves will separate from stems as soup cooks. Remove herb stems and bay leaf from soup, add the parsley, and place pot on table on a trivet. Let soup rest and begin to cool for a few minutes. Ladle soup into bowls and top with lots of grated cheese. Pass crusty bread for bowl mopping. This pie was the perfect finale for my “Southern Supper” of Roasted Pork Loin and Creamy Peas with Bacon. I was excited and nervous to make this all at the same time. I will be the first to admit I am not the greatest baker. I can make some mean Christmas cookies, but as far as other baking goes I have been pretty limited to boxed cakes and cupcakes etc. That is why I have decided to push myself and try more and more. I mean it is a good thing to get outside of your comfort zone, right? Of course that entails me making desserts for the whole family. I know they will enjoy them but they may curse me if the scale starts reflecting it. I am bad, I will take one serving and leave the rest to them. But they are my tasting team, I am just the humble cook. Anyway, back to the pie. This pie has a wonderful custard like texture. 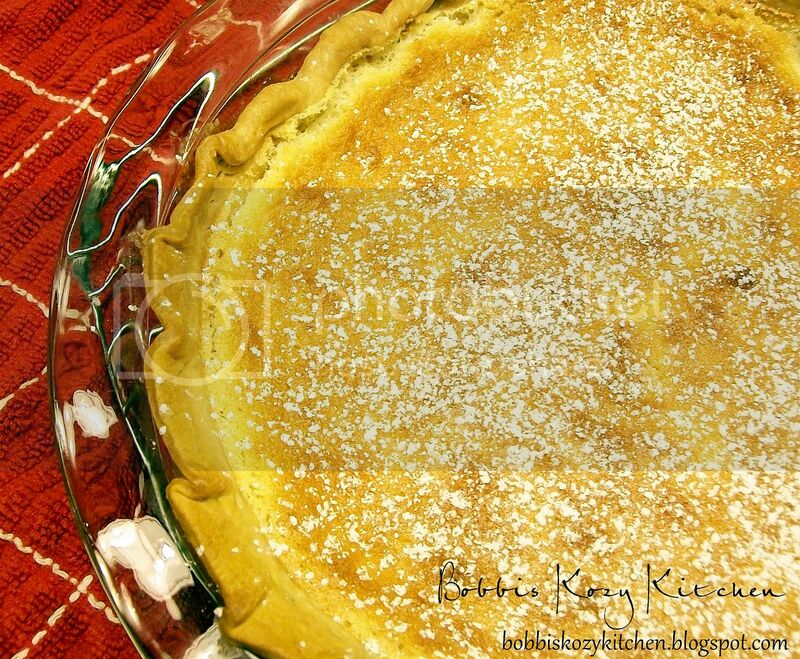 You can taste the bite of the buttermilk along with the lemon from the lemon juice and zest and the fresh grated nutmeg. We all really enjoyed it and in the end I was very proud of what I accomplished. So don’t be afraid if you are not an accomplished baker. Trust me, if I can do it you can too!! Give it a try! Ease the dough into a 9-inch deep dish pie plate and crimp as desired. Pierce all over with a fork. Line the dough with parchment paper, then fill the pie with dried beans or pie weights. Bake until the edges are golden, about 20 minutes. Remove the paper and weights and continue baking until lightly golden all over, about 10 more minutes. Let cool completely on a rack. Make the filling: beat the butter and the sugar in a stand mixer fitted with the whisk attachment (or use a hand mixer) on medium-high speed until combined, about1 minute. Add the egg yolks and beat until pale and thick, about 1 minute. Reduce the mixer speed to medium-low, add the flour, lemon juice, lemon zest, nutmeg and salt and beat until just incorporated. Increase the speed to medium-high and slowly pour in the buttermilk. Scrap down the sides of the bowl and continue beating until combined. Transfer to a large bowl. Clean the mixer and whisk attachment. Add the egg whites and beat on medium-high speed until stiff peaks form, about 4 minutes. Fold the egg whites into the yolk mixture in three additions until no white streaks remain. Pour the filling into the prepared crust. Transfer to a baking sheet and bake until golden and set around the edges (the center will still jiggle), 45 to 50 minutes, rotating the pie halfway through, let cool on a rack. Dust with confectioners sugar before serving. 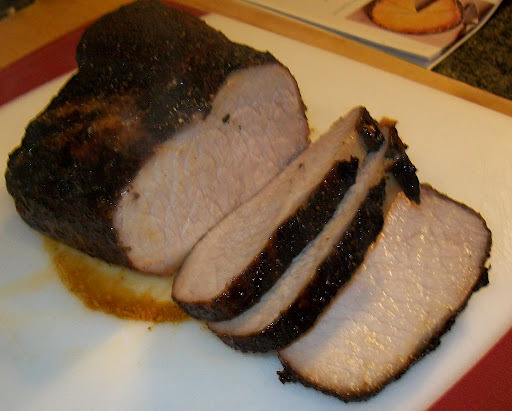 Going along with my Creamy Peas with Bacon post is this fantastic roast pork loin. As I said in the creamy peas post, I found the menu for what Food Network Magazine called “Southern Supper”. Everything looked so good to me and it even inspired me to make the Buttermilk Pie the menu called for (stay tuned for the post of that recipe). What was nice about finding this menu was that I already had a pork loin in my freezer. Whenever I can find pork loin on sale I buy a good amount of it. I love the fact that it is so versatile. You can cook it whole as a roast, make cutlets, cube it for things like Pork Stew, etc. But when it is on sale it is very economical to stock up on it. This recipe peeked my interest because it includes brown sugar, chili powder, and vinegar. All things I like in my BBQ rub. So I figured how can it go wrong? I was right. Nothing wrong with this one at all. The only thing is you have to be patient. Something that is hard for me to do. The rub needs to be on the roast for a minimum of 4 hours, overnight being much better. I usually end up opting for the shortest amount of time, but this time I was determined to give it as much time as possible. I am so glad I did. I would say that this would make a wonderful Sunday night supper meal, but I would enjoy this any day of the week!! I was so excited about this roast that I didn’t even move the magazine out of the way to take the picture!! Mix 2 tablespoons brown sugar, 2 teaspoons mustard powder, and chili powder, 1 tablespoon salt, and one half teaspoon pepper in a bowl. Put the pork on a plate, pat dry and rub allover with the spice mixture. Refrigerate uncovered for at least 4 hours or overnight. Whisk the remaining 2 teaspoons brown sugar, 1 teaspoon each mustard powder and chili powder, the Worcestershire sauce, vinegar, 1/4 teaspoon salt and pepper to taste in a bowl. Set aside for brushing. Preheat oven to 375 degrees F. Rinse the pork and pat dry. Heat the olive oil in a large skillet over medium-high heat. Add the pork, fat side down, and sear until golden all over, about 5 minutes. Continue to cook until golden allover, about 5 more minutes. Transfer to a rimmed baking dish, fat side up, and roast for 30 minutes. Brush with 3/4 of the vinegar mixture and continue to roast an additional 15 to 20 minutes, or until the internal temperature reaches 145 degrees. Transfer to a cutting board and brush with the remaining vinegar mixture. Let rest 15 minutes before slicing. I have been so excited to see the fresh summer produce coming into the market. My little mind has been working overtime trying to come up with new and creative ways to use it all. When I saw the bin of sugar snap peas I knew that was what I wanted to work with. I had a recipe from the Food Network magazine for a Southern Supper menu and creamed peas were on it. I knew I wanted to start out with that and work my own twist into it. I really didn’t change it much, the addition of bacon was my thing. I mean everything goes better with bacon right? Heck ya!! Seth was off work last night and earlier in the day he had asked me what I was making for dinner. I told him about the roast pork loin and the buttermilk pie and then mentioned the creamed peas followed by “I know you don’t like peas but…”. His response, God love him, was “Mom I like anything you make” aawwwww melt a Mom’s heart. So with that said I was very excited about the entire meal. Kevin’s son Dylan’s girlfriend was here and, bless her heart, she helped me shuck peas for about 2 hours! That was the hardest thing about this dish. I was determined to use fresh peas instead of frozen because I knew there would be so much more flavor in the dish if I did. The only problem I found was that this early in the season there were a lot, and I mean a lot, of the pea pods that had teeny tiny little peas that weren’t even worth the effort of the shucking process. That was a bit annoying. But in the end we all agreed that the dish was well worth the effort! I hope you agree. 4 cups shelled peas (from 4 to 5 pounds pea pods) or frozen peas. Chop the bacon and heat it in a skillet over medium high heat until crisp. Remove from pan with a slotted spoon and reserve on a paper towel. Bring 6 cups of water and 1/2 teaspoon a salt to a boil in a sauce pan. 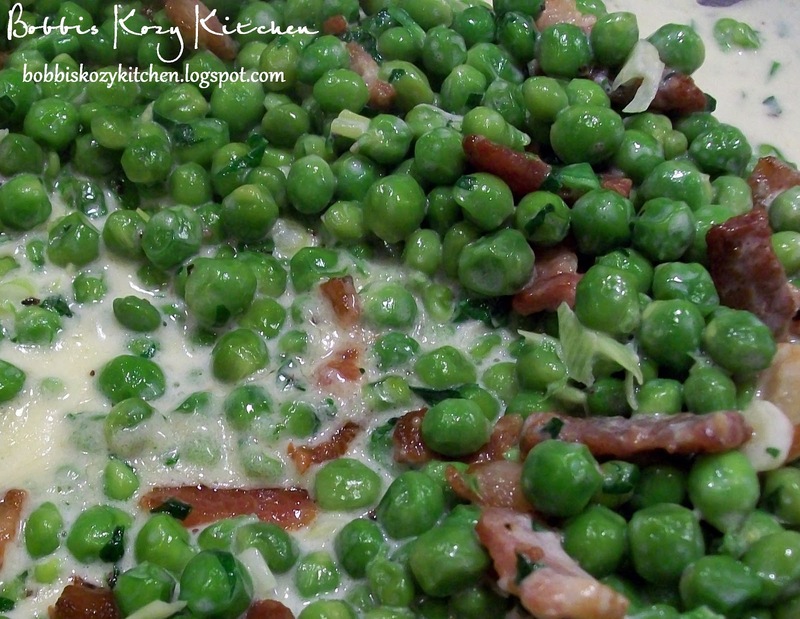 Add the peas and cook for 10 minutes from fresh peas or 3 to 4 minutes for frozen. Drain and transfer to a bowl and keep warm. Add the cream to the pan, bring to a bail and cook until reduced by half, about 3 minutes. Whisk in the butter then add the peas and toss. Add the parsley, scallions, and bacon, season with salt and pepper to taste and combine. I have always loved beets, but the only way I had ever had them was out of a can. My Mom rarely cooked with fresh veggies so canned was all I knew. I was watching Food Network one day and they were talking about roasting beets. This was new to me! I know, I must have been living under a rock right? I knew I loved many other veggies roasted, carrots, parsnips, potatoes, Brussels sprouts, the list goes on. So I asked around the house and found out, much to my surprise, most everyone was interested in trying roasted beats! Wooohooo I thought, let’s go!! I really like this recipe because you use the whole vegetable, root to green. I am always looking for ways to make my food dollar worth more and this does just that. It give you two dishes for the price of one. I mean why waste when you don’t have to? This recipe is fairly straightforward and simple. Be prepared to make a bit of a mess since the beets will make everything red. When I was done it looked like Freddy Kruger had made a visit to my house! I know the picture isn’t as pretty as it could be. I had a little struggle getting the skin off the beets so that is why they look square. Hmmm maybe I shouldn’t have said anything and hoped you thought I did it on purpose. But no matter how it looks, this is a wonderful recipe, perfect for a nice Sunday supper. Wash the beets, leaving the skins on and remove the greens. Remove the stems from the greens and set them aside. Place the beets on a roasting pants and toss them with 2 tablespoons olive oil. Cover and bake the beets for 60 minutes, or until a knife slides through the largest beet easily. Remove the beets from the oven and set aside to cool enough that you can remove the skins. Meanwhile heat the remaining olive oil in a skillet over medium heat. Add the onion and cook until translucent. about 5 minutes. Add the garlic tot he onions and cook for another minute. Tear the beets greens into 2 to 3-inch pieces and add them to the skillet. Cook until greens are wilted and tender. Add the red wine vinegar and season with salt and pepper. 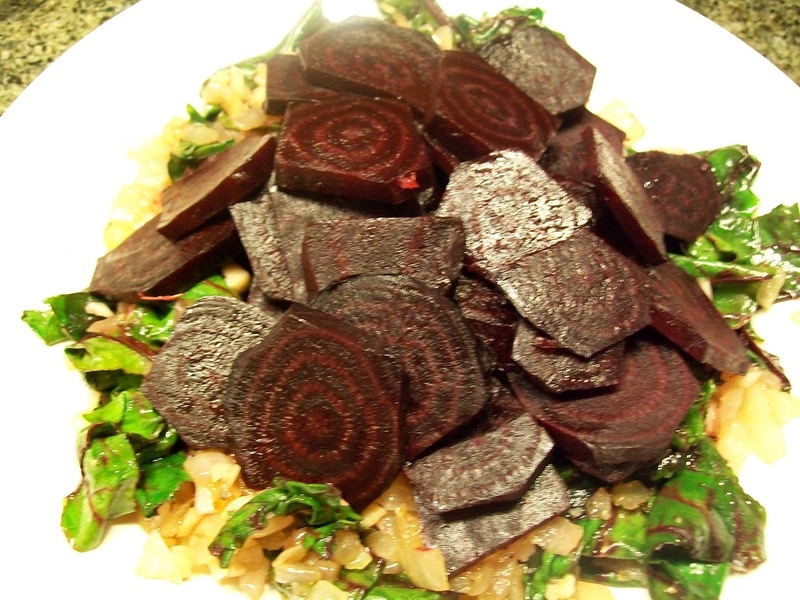 Serve the green with sliced beets on top. Season the beets with salt and pepper if desired. I know that my schedule for the blog has pretty much been a mess since last November, when my father passed away. It has just seemed like it has been one thing after another with my health and my furbaby Angel’s health, etc. But I am going to be getting back to normal now. I promise! Wednesday used to be “Rachael Ray Wednesday” here at Bobbi’s Kozy Kitchen. Those of you that have known me for a while know that my journey into the foodie universe began with my gastric bypass surgery and my discovery of Rachael Ray. Her recipes weren’t scary, and for a new cook that was so comforting. My first blog was called Bobbi Renee and Rachael Ray (ala Julie and Julia) but as it began to grow several people warned me that there might be some copyright issues if I continued using Rachael’s name so Bobbi’s Kozy Kitchen was born, but I still like having a day to celebrate recipes from the person that gave me the courage to do what I am doing now. Wow am I gushing or what? Geezz Bobbi!! Ok, I am done now. Let’s get on to the recipe. We did what I call BFD (breakfast for dinner) last night. Mostly because we all love smoked salmon here, but also because I wanted to start sharing some recipes that would work well for a brunch menu (hint hint guys Mother’s Day is coming soon). It is super simple, super tasty, and a wonderful dish for any time! Another plus for this meal? I got extra smoked salmon so I could have a bagelwith salmon and cream cheese today yummmmm!! Reserve 2 slices of salmon for garnish. Chop the remaining salmon into very small pieces. Whisk your eggs and cream together. Add 3 tablespoons of your chopped chives and season eggs with salt and pepper. Preheat a large nonstick skillet over medium heat. Melt butter in the pan and add eggs. Scramble eggs with a wooden spoon. Do not cook eggs until dry. When eggs have come together but remain wet, stir in chopped salmon. Remove pan from the stove and place on a trivet. 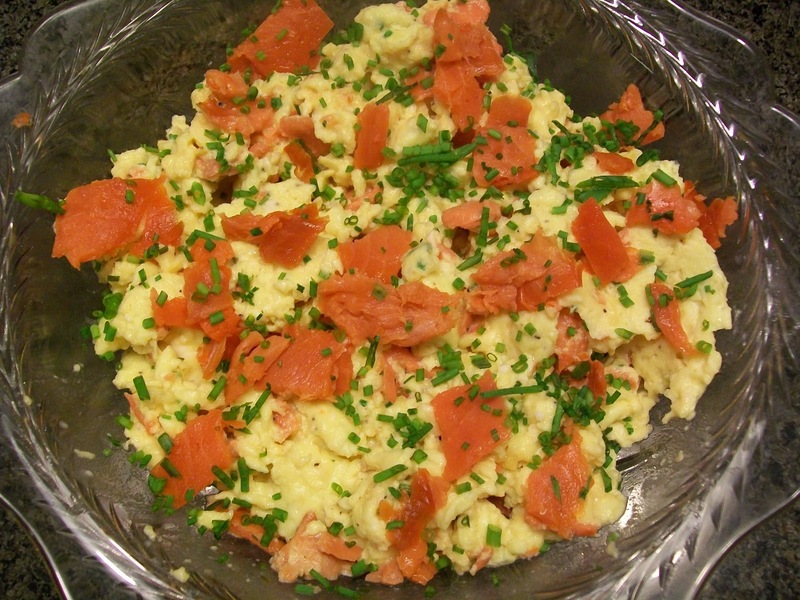 Garnish the eggs with remaining salmon and chives and serve. *side note* If you are serving these eggs with the other recipes provided as a brunch, a platter of store bought fruit filled dainties will complete your elegant brunch. Allow 1 dainty per person but halve dainties so that guests may mix and match varieties. Now that it is “officially” summer and we have actually had summer like weather here in Western Washington. I mean 70’s in April? Color me shocked, really shocked!! As soon as I saw the forecast I couldn’t wait to break out one of my BBQ meals. We all love BBQ here. Ribs, chicken, you name it. Especially when I can use my “famous” (the families name not mine) homemade rub and BBQ sauce. It has taken me a few years to really get them where I want them and the family has told me to STOP tinkering with it, that it is perfect. Since my goal is to make yummy food and make them happy, I guess I achieved that goal with my rub and sauce (although I do still tinker with it now and again ssshhhhhh don’t tell). We already had chicken in the freezer, but when I spotted the ribs at the store I knew I HAD to get them. It has been a long time since we have had ribs and they just sounded so good. A nice rack of baby back ribs slathered in BBQ sauce? Mmmmm I am hungry again. Now, since it was just Kevin and I with Ms Picky Pants being gone to California (I miss you Picky Pants) this was one of the times I tinkered with the recipe a bit. I added extra cayenne pepper to the rub. We love it spicy and I knew the boys wouldn’t mind it when they ate leftovers. I will post the original recipe so no fear of extra spice but if you DO want to kick it up a notch just add double (or more) of the cayenne to the rub. I also made Spicy Coleslaw and Red Skin Potato Salad. Both of them have a tad bit of vinegar in them so they went really nicely with the ribs. Kevin and I decided, with the spice of the ribs, it was nice to take a couple of bites of the ribs and then a bite of the coleslaw. The creaminess of it just topped everything off! I so need a better camera!! Combine all ingredients for the dry rub in a small bowl. Rub the ribs generously on both sides and wrap in plastic wrap. Let marinate in refrigerator at least 8 hours, preferably overnight. 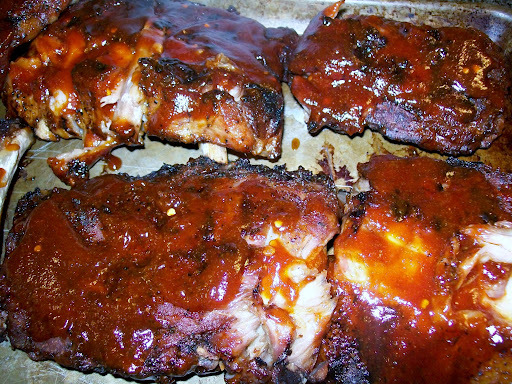 Place ribs on a large baking sheet lined with foil. Cover tightly with foil and place on the middle rack of the oven. Let roast for 2 1/2 hours. Add the ingredients for the BBQ sauce to a medium sauce pan. Bring to a boil and then reduce to simmer. Simmer for 30 minutes over low heat, stirring occasionally. Take the ribs out of the oven and place them on the grill. Cook for 20 minutes, turning and basting with the sauce. Remove from grill and serve. Halibut Soup or just call it Epic Yumminess in a bowl!! I was sooooo excited to find this recipe! Halibut is one of my all time faves PLUS it was on sale (thank goodness) this week, so my pound and a half didn’t cost me an arm and a leg. 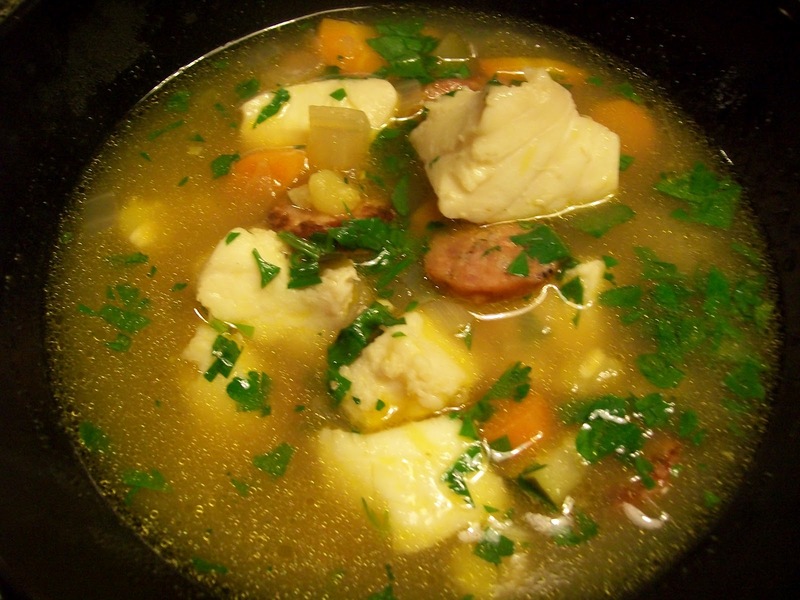 The first time I made this soup was back when I had my blog “Rachael Ray and Bobbi Renee”. I was new to the whole blogging thing and got so carried away with how good the food came out I forgot to take a picture. I also forgot to completely read the recipe so when I got ready to make the soup WHOOPS not all the ingredients were there. I used to do that a lot. Luckily I have gotten much better. This soup could be made with cod just as easily, and much cheaper, but I do love halibut so much and again it was on sale so I have no guilt about it. I can’t say enough about how awesome this soup is!! With the andouille sausage and poblano pepper it gives you just enough heat to make it tasty but not blow the top of your head off. Oh and don’t forget the crusty bread to mop up all of that yummy broth!!! Preheat a large soup pot over medium-high heat with the olive oil. Remove the sausage casings and slice it thinly. Add the sliced sausage to the pot and cook, stirring frequently, about 2 minutes. Add the onions, carrot, poblano, and garlic. Season with salt and pepper. Cover the pot and cook for 5 minutes, stirring occasionally until the veggies are tender. Add the white wine and cook for another 3 minutes. Add the chicken stock and bring the soup up to a simmer and cook for 5 minutes. Add the hominy, and zucchini and let cook on a slow simmer for 5 minutes. Slide the fish into the soup and turn the heat of. Cover the pot and let sit for 5 to 10 minutes to allow the fish to poach. This will prevent overcooking the fish. Uncover and stir in the parsley, cilantro, and lime juice. Ladle into soup bowls and serve with crusty bread for sopping. I know I have talked about my love of Mexican food about a million times right? OK so here is one million and one. 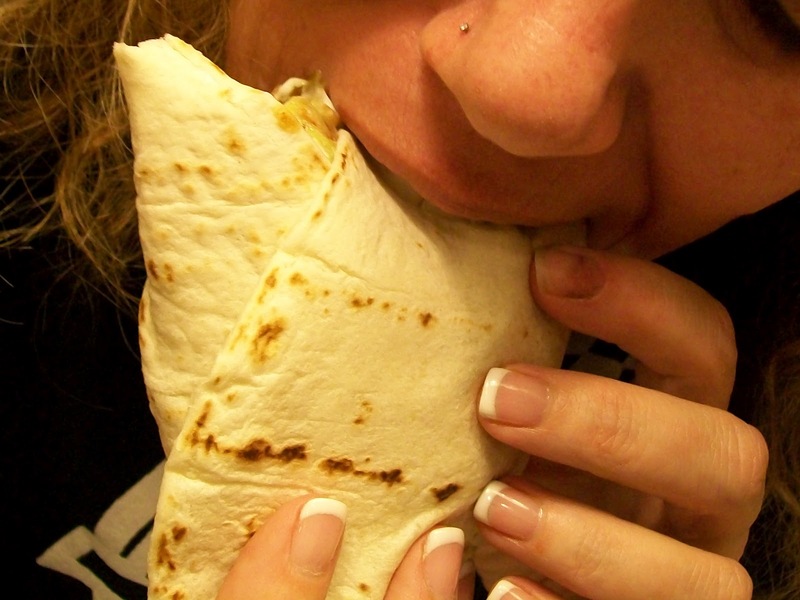 Carne asada burritos were a favorite of mine when I lived in Southern California. Since moving to Western Washington I have yet to find a restaurant that made it to my liking. I also don’t have my little Mexican meat market to go to and pick up some pre-marinated meat (yes I was spoiled). For the last few years I have been searching for a marinade so I could make my own but never found one that really tripped my trigger. Then the other day I posted on my Facebook page and Twitter that I was again on the search for the elusive recipe. One of my Twitter friends sent me a link to his blog Damn Delicious and his version of a carne asada recipe. It was nice to find a recipe that not only sounded good but I already had feedback that it WAS good. I of course had to change it a bit though. So off I went to gather the appropriate items to make my mouthwatering treat. This marinade would probably better if you could marinate the meat overnight but I didn’t have the opportunity (or the patience) to do so. I let it set for about 6 hours though and it came out very good. I am looking forward to trying it again when I can leave it overnight though. I mean it can only get better right? I made this the other night to go along with my Halibut Ceviche. I also made my “Holy Guacamole“. Both of them have been a family favorite for many years so I knew they would be an instant hit as partners with the carne asada. I was right! Now the first picture is of the meat after it came off of the grill. Kevin isn’t a big burrito lover so he just wanted his steak sliced, plus he likes it very rare. So once he had his portion I cubed the rest of the carne asada and cooked it in the remaining marinade. This is the more So Cal way of preparing the meat for burrito consumption. A special note – We decided to make “Surf and Turf” burritos. We added the Halibut Ceviche to the Carne Asada along with some pico de gallo salsa and the guacamole. OhhEmmmGeeeee HEAVEN!!! Combine all of the ingredients in a ziplock bag and add the meat. Let sit in the refrigerator 6 hours to overnight. Heat a grill to medium-high heat. 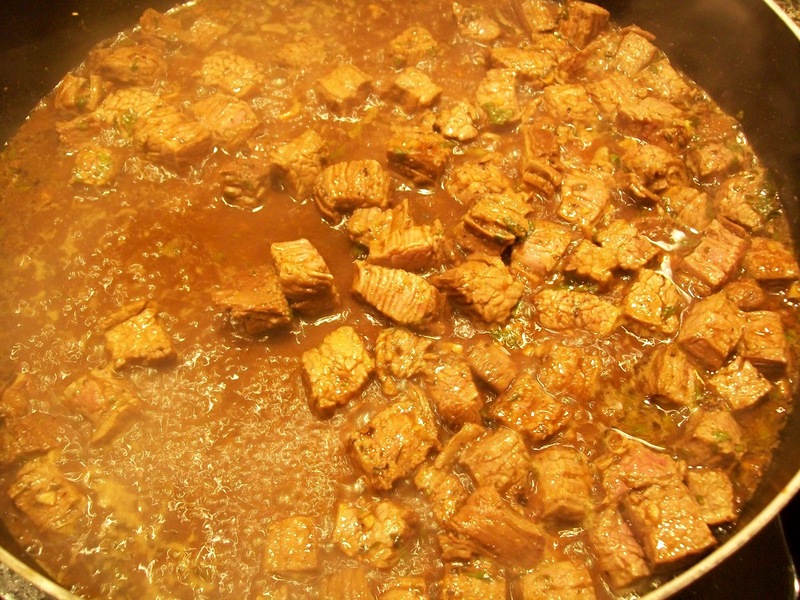 Remove the meat from the marinade, reserving the leftover marinade. 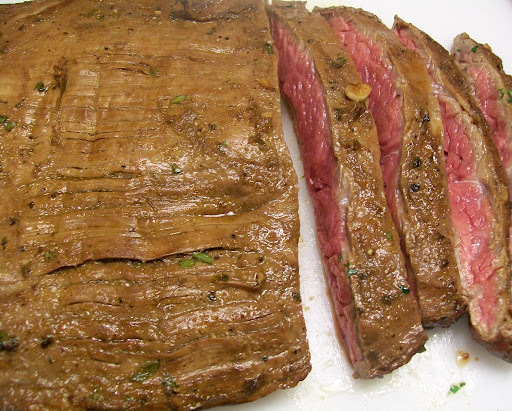 Grill the steak for about 5 to 6 minutes per side (depending on the thickness of the steak) for medium rare. Allow the meat to rest for about 5 minutes, then slice (or chop). Return the meat to a medium skillet heated over medium-high heat. Add the leftover marinade and cook for a minute. Top with your favorite garnishes and eat with warmed flour tortillas. Hello my wonderful friends out there in Foodieland! I know I have been absent for a long time (it feels like forever for me). Lots going on in my life and unfortunately cooking took a backseat to most of it. I finally buckled down and decided I needed to get back in the saddle so I sat down to create a menu for the week. I had glanced over the store fliers and saw that my local Albertson’s had fresh halibut for $15.99 a pound! I know that seems like a lot even on sale, but halibut can be upwards of $28.00 a pound later in the season, and seeing as it is my all time FAVORITE fish you know I was jumping up and down like a little kid that just found the toy they want in the Toys R Us catalog!! I finished up my weekly menu (which includes another halibut dish aside from this one) and hurried off to the store to purchase all of my goodies. I wandered through the store for about an hour getting other ideas as I saw the fresh meat and produce they had available. WOW I didn’t realize how MUCH I missed being in my kitchen! Then rushed home to get everything put safely away. Last night I actually made two recipes.Carne Asada and the Halibut Ceviche. I will post the Carne Asada tomorrow. So the first thing I had to do was get the marinade going for the meat. You don’t want to get your ceviche going until it is about 3 to 4 hours away from meal time. Even though the fish only “cooks” in the citrus juices, it can over cook and be kind of rubbery. 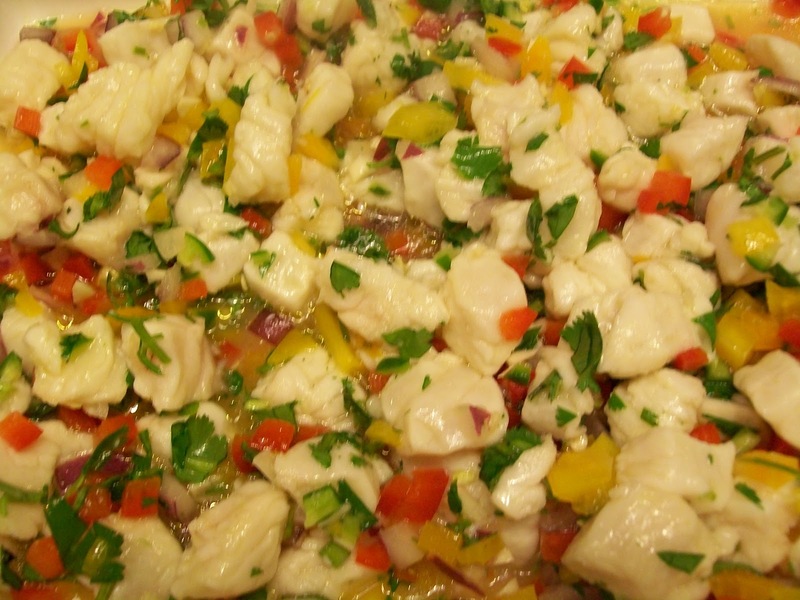 A side note, I discovered ceviche on a trip to Puerto Vallarta many many years ago. They made it with a white fish and served it on little mini tostada shells (it was heavenly!!). So you can make this with any firm fleshed white fish you would like. I think cod would be nice. Since I can’t find mini tostada shells here in Western Washington, we usually eat it with tortilla chips, but stay tuned for Thursday’s post because I will let you know the fun way we mixed it up this time! Cut the fish into 1/4-inch dice. Place in a glass dish with the lime juice, orange juice, pineapple juice, peppers, onions, and garlic, tossing to coat. Cover and refrigerate for 3 to 4 hours, stirring occasionally. Add the cilantro, olive oil, and salt. Fold gently to mix. You can serve the ceviche in martini glasses for a nice appetizer.